Alison Hilliard grew up a Protestant in Ian Paisley’s Northern Ireland, where any devotion to Mary was scorned; Mark Dowd is a cradle Catholic and former friar; and Remona Aly is a Muslim who loves Christmas, but approaches Mary very much from a Qur’anic perspective. In this Christmas programme, these three very different people go on pilgrimage together to experience the mother of the Christ child. 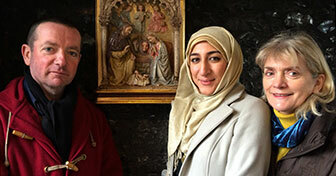 Their destination is Walsingham in North Norfolk, “England’s Nazareth” and its most important shrine to Mary. All three are Things Unseen presenters and, by background, critical journalists. Yet as they meet Mary through each other and the people they encounter in Walsingham, astonishing stories emerge: stories of visions and prayers answered, of motherly love and comfort – and of Mary as a strong woman and disciple who has none of the sugary, sentimental qualities so often attributed to her. “I see you in a thousand pictures”, the Romantic poet Novalis says of Mary, “yet none can describe you as I see you in my soul.” This programme focuses not on what we know about Mary historically or theologically, but on how, in the 21st century, three very different people experience Mary and let themselves be challenged by her. We are grateful to the Pontifical Council for the Promotion of the New Evangelization for their permission to use The Mercy Hymn in this programme. From as long as my childhood memory goes, Mary has always had a prominent place in our family. My mother dedicated each of her children to Mary’s care from the moment she knew she was expecting a child. We were then dressed in blue and white until our first birthday when my mother took us to offer her thanksgiving for the safe delivery and safe keeping of her child and we were dressed in our first outfit of colours. Icons of the Theotokos were always visible in our family home. Our Blessed Mother is very much my mother especially since the death of my own. Surely there is nothing more natural than invoking her power of intercession with her Son – after all did she not assist the young couple at their marriage in Cana albeit without their knowledge. The reporting of the pilgrimage to Walsingham was most enlightening. Thank you. I am a cradle Catholic and every year I walk with my friend Vincent, an Anglican vicar on the Camino. He pointed out Mary to me naturally carved in a river cliff. She was cradling Jesus in her arms and there were another three figures carved into the cliff all focused on the child. They call this phenomenology – it was amazing. Honestly the best piece of religious journalism that I’ve heard in years. Thank you ever so much! I found this such a beautiful and thought-provoking programme. One thing I especially loved was how the presenters spoke so frankly about their own experiences. You really felt as though you were on the pilgrimage with them. It fascinates me how everyone has different experiences of Mary….different aspects of her which chime with them in different ways. Very engaging. Really looking forward to the next programme. There is a church in the city St Kolumba which has been renovated and has a black stone wall at the back inscribed with the names of war victims. The main stone figure in it is ‘Mary in the ruins ‘, a figure who holds the baby in her right arm, but the hand on the left arm is missing. The figure stands proud and erect and reminds me of the women who rebuilt Cologne soon after the war ended from the rubbles. My mother was one of the women who helped. On the efforts, the pain, the poverty endured but the perseverance to create a new existence are based my love and faith for Mary in my present life. What a beautiful and engaging programme, intelligently presented and superbly crafted. The sights and sounds and even smells of England’s Nazereth were vividly brought to life, and we were provided with fascinating insights into the different and shared approaches to the theology of Mary embraced by different faith traditions. This was a perfect gem, which deserves far wider exposure and a much bigger audience, instead of being tucked away on the internet. We haven’t forgotten – we are hoping to go back to Walsingham soon to do another programme! Don’t forget THE ORTHODOX CHURCH In Walsingham. This was an amazing introduction to Mary from an ecumenical perspective. I’m glad the “worship of Mary” thing was mentioned and cleared out of the way. As a Christian who belongs to two communions (catholic and evangelical) I feel often frustrated by both what I see as an exaggeration of the devotion to Mary and the Protestant “fear” of Mary. Mary is the first among Jesus’ disciples, the one who perfectly incarnates the mystery of the predestination of the elect. She is our Mother because she is the Mother of Christ, and we are the Church, his body. Worship of Mary would be something she would never consent to, for at Cana she first pointed out to Jesus. Jesus came into the world through Mary’s consent. He started his public ministry at Cana through Mary’s consent. He will come back at the end of time though Mary’s consent. So, in this Advent time, let’s invite Mary to help us welcome Jesus.